Please welcome today’s guest poster, Mary Hickcox. We are addicted to chemicals: bleach, window cleaner, shampoo, body wash, laundry detergent, fabric softener, conditioner, deodorant, toothpaste, body creams, shave gel, dish soap, antibacterial spray, deodorizer, mildew remover, and the list goes on and on. We have been convinced that we need these products in order to keep natural odors and bacteria, mold, and germs at bay. But the cost is staggering in many ways. I’m as guilty as the next person, having spent loads of money on all these products over the years without considering the impact they had. I suppose the first step for me in making a change was deciding to use cloth diapers for my youngest son. It was far easier than I ever imagined. When talking to a good friend about how we could change our ways, she said to me, “well you just do the best you can do.” At that moment, I realized that I may tell myself I’m doing my best, but I knew that I wasn’t, and I knew I could do more. It’s easy: just stop buying all those products to clean your home and replace them all with plain white vinegar and you’ll see a huge savings on your grocery bill. Does it really work though? Well, I have a very messy family of 5 including 3 boys under 12, two dogs, the occasional free-range chicken roaming in the kitchen, and vinegar still does the trick every time. It is inexpensive, natural, safe, and kills 99% of bacteria and 85% of molds and germs. It is easy, better for you and the environment, and you’ll save a fortune. What cannot be accomplished using vinegar can most likely be accomplished using another safe, cost effective item: baking soda. It is a great odor eliminator and fire extinguisher, so many of us already have some in the house. The simple ways that our family benefits from baking soda is as a deodorant and as an abrasive cleaner. 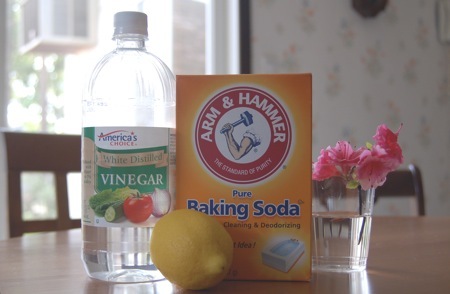 At less then a dollar for a two-person month’s worth, you will save big by swapping your deodorant for baking soda. Effective, easy, and safe! I make over 300 ounces of detergent in 10 minutes and it costs around $4. To make an easy, effective detergent I grate a bar of soap (biodegradable, safe, and neutral bar of soap), throw it in a saucepan with a small amount of water, and cook until it is melted (about 5 minutes). Take 2 gallons of hot, not boiling, water and add the soap to it. Stir until dissolved, add 2 cups of baking soda and a few drops of tea tree oil or your preferred blend of essential oils, stir and pour into adequate containers. I find that shaking the detergent before using ½ cup per large load is most effective. There are many brands of castile soap out there, but I find Dr. Bronner’s to be a great value for an exceptional product. It is all vegetable based, fair trade, organic and completely biodegradable. Castile soap can be used for many things, but we primarily use it for showering. It can be used as shave gel, body wash, shampoo and even toothpaste. It also has an oil base, so I find that even with my thick hair I usually do not need any conditioner. Amazing product and so versatile. These days we all spend a lot of time on the Internet, so why not spend some extra time researching what you can do to keep your family and the planet healthy? If one thing you try doesn’t seem to work, then just look up a different recipe and try that one. All in all, these really are simple changes to make; it is just a matter of setting your mind to it. I have continually been amazed at how easy it has been to make these changes, and how rewarding it feels to know I really am doing my best to make a difference in my household. Try changing just one product a month as an experiment. Within 6 months you will be able to look what you have done with pride that you saved money and created a healthier household and planet. Mary Hickcox, RN, is mama to Dylan (11), Colin (7) and Theo (3). Thank you so much for a great post, Mary! I am a huge fan of using vinegar as a cleaner. It just works so well! What an amazing introduction to this website! So glad I stopped in and learned about how to make detergent. I’m never happy even with the usual crop of ‘natural’ laundry soaps because most have allowed those lung-irritating sulfates to creep in. For the rest, it is well stated and everyone can learn the basics of household cleaning. I love it and continue to refer to the site for green alternatives! Thanks for the section on making liquid detergent. I’ve been making powdered detergent for years. I can’t wait to try making liquid! Mix together and use 2 tbsp per load. I wash in cold water and use white vinegar as fabric softener. Showed this article to my wife and she was skeptical but was willing to try. Now our cleaners are green and my pocket book is happy.